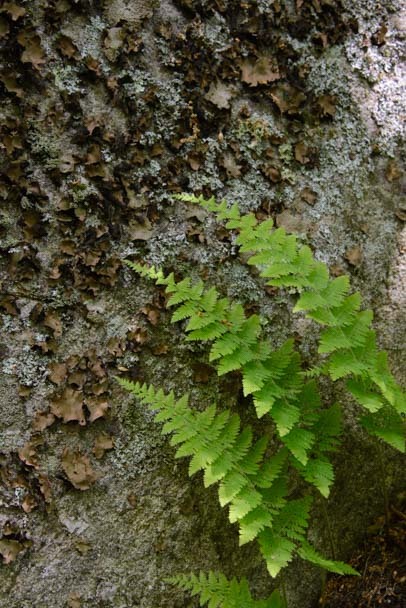 Shenandoah National Park, Virginia – Climbs & Falls! June, 2015 – The Blue Ridge Parkway connects Great Smoky Mountains National Park in North Carolina with Shenandoah National Park in Virginia where the Parkway morphs into Skyline Drive. 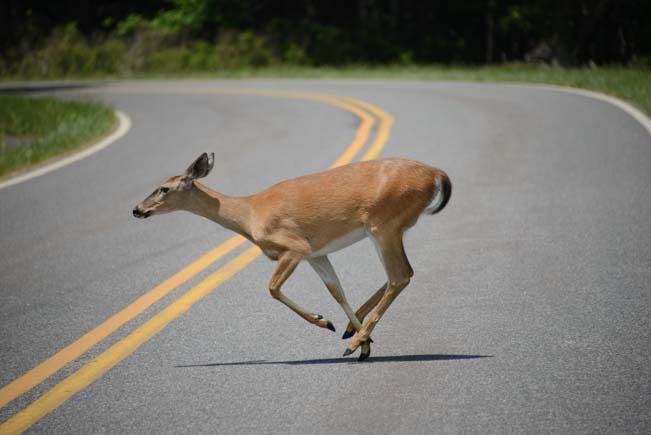 The difference between the Blue Ridge Parkway and Skyline Drive is very subtle, as both of these long drives is a winding, hilly road under a canopy of green trees. 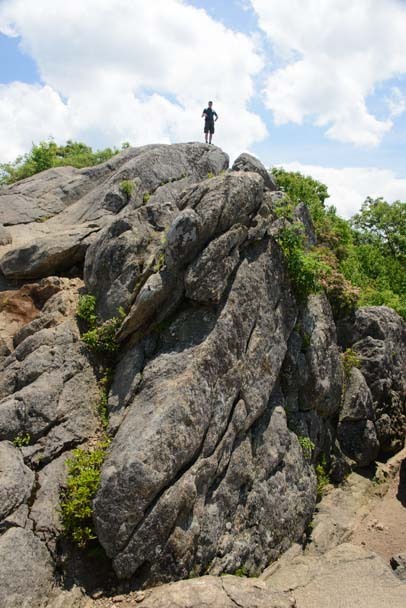 As we drove on Shenandoah’s Skyline Drive, we began seeing more rock faces on the sides of the road, and there were more open areas where the views opened up. 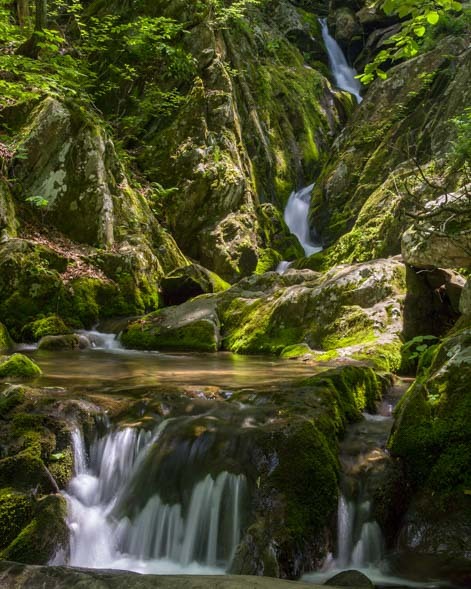 Unlike the Blue Ridge Parkway where many scenic overlooks actually have no view at all because overgrown trees stand in the way, Shenandoah National Park’s scenic viewpoints all feature a real view. We saw some lovely vistas of mountains fading off into the distance. 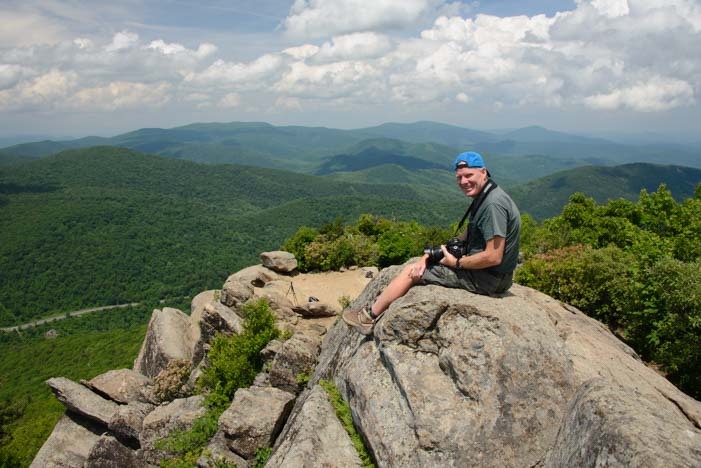 This difference may be due, in part, to the fact that the Blue Ridge Parkway, which is managed by the National Park Service, is free for all travelers to use, whereas Shenandoah NP, which Skyline Drive traverses, charges the usual National Park fees. When all the great national parks in the western states were being built in the early 1900’s, there was a desire in the eastern states to create a similar park that set aside beautiful lands and made them available to people for recreation. The tricky part was that most land was already privately owned. Shenandoah was created in 1935 through government acquisition of private land by eminent domain. Before it was even officially open, the crowds arriving from Washington, DC, and other nearby cities to enjoy the great outdoors were staggering. The crowds can be overwhelming today too, and at a few of the hiking trailheads we found it was nearly impossible to find a parking space. 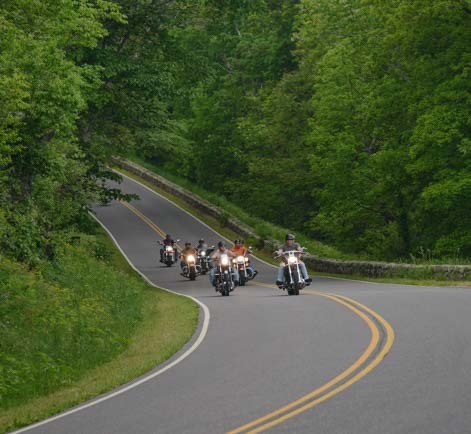 Just like the Blue Ridge Parkway, this is a road that is loved by motorcyclists as well as motorists, and we saw many groups of them out having a ball on these twisty mountain roads. There is still plenty of peace and quiet and wildlife in Shenandoah, however. We saw lots of deer, including one that sprinted across the road in front of us. 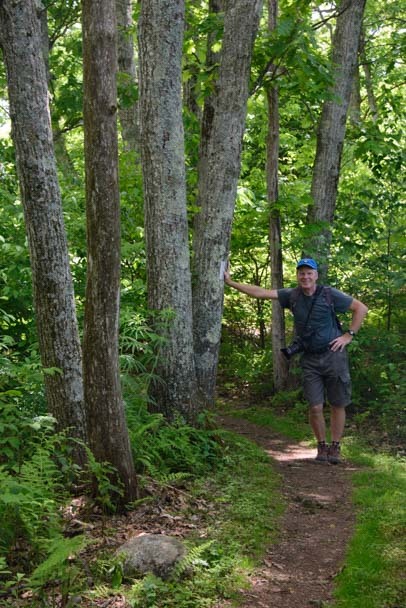 Even more exciting, on one of our hikes Mark spotted a black bear just 100 feet from the trail. We both tried like crazy to get a good photo, but he kept his rump to us and a thousand skinny tree branches obscured our view of him. Oh well. It was still really cool to watch him going about his business in the woods. 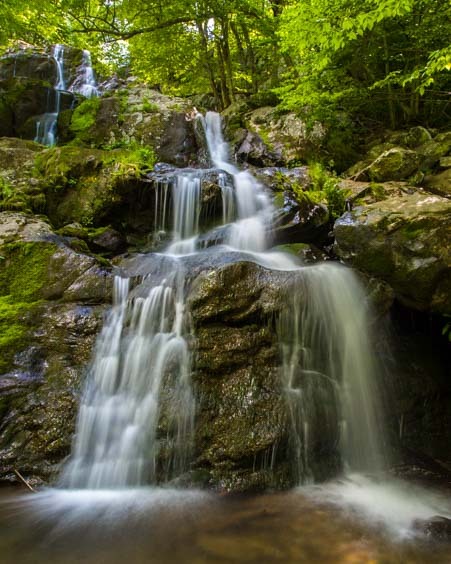 We decided to do one waterfall hike in Shenandoah to wrap up our waterfall theme on this leg of our travels. 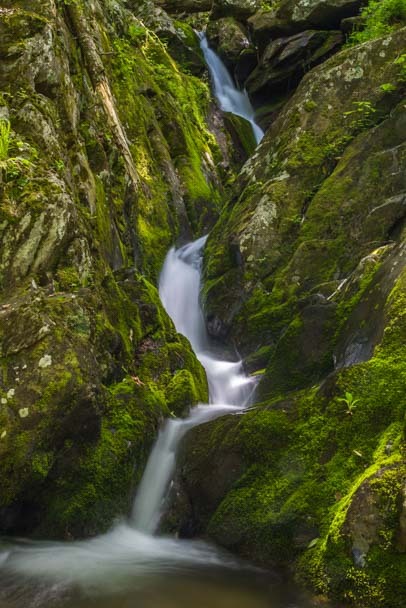 We had just about had our fill of waterfalls — who would have thought that was possible back in the Smokies? — but we had room for one more. Dark Hollow Falls is a beautiful waterfall that has an upper section and a lower section. We hiked down from the top (although lots of people came via a different, easier route), and the view looking up at the upper falls was wonderful. We were there on a Sunday, and the crowds were thick. People waited and took turns getting photos of themselves standing on the rocks at the base of the waterfall, and the trails were loaded with people of all ages. The hike down from there to the lower falls was easy and the lower falls were very pretty too. We also hiked to Mary’s Rock. This time we went midweek, and we were the only ones on the trail. There was a lot of activity in the woods around us, however. 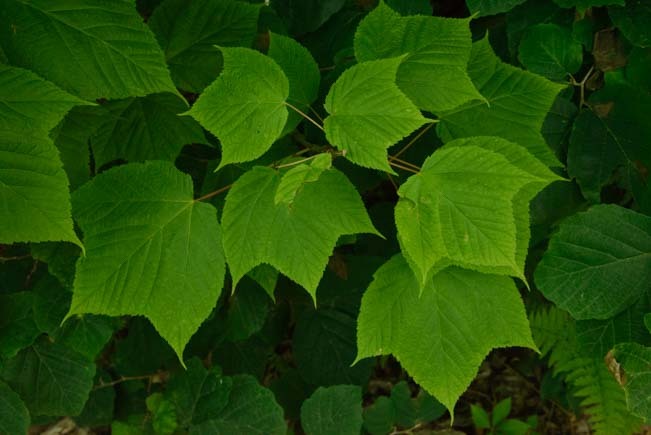 Squirrels made noises in the underbrush and songbirds filled the air with beautiful warbling. 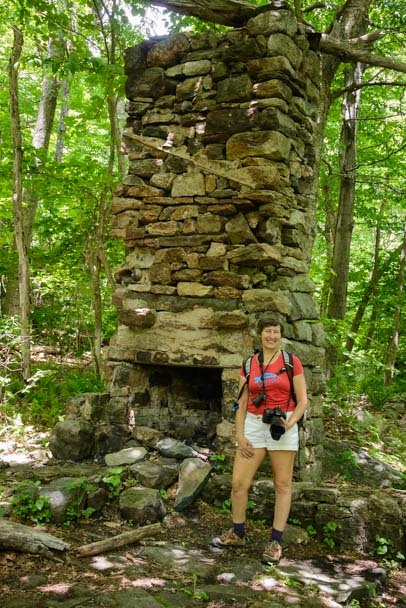 We came across a strange rock chimney standing in the middle of the woods. There was no plaque or marker on it. Just the chimney standing there. Adding another odd note to this weird orphaned chimney, we found a brand new Keene sandal sitting right in the middle of the trail. Hmmm… something old and something new! After taking a left turn near the end of the hike, the trail suddenly opened up, and we were staring at Mary’s Rock and the vast rolling green hills beyond and far below. There were lots of big boulders all around, and we had fun scrambling to different peaks and pinnacles. There are great views from the tippy top!! Mary’s Rock is at the north end of Shenandoah National Park, and this hike was our last foray into the ribbon of national park lands that stretches nearly 500 miles from Cherokee, North Carolina to Front Royal, Virginia. We had finished our nearly four week trek north along this unique strip of lush mountains, and as we put away our hiking shoes and camelbacks for the last time, we knew we’d barely scratched the surface of this rich area. We’ll be back for sure! But for now, it was time to switch mental gears to get ready for our upcoming summer RV adventures that awaited us far to the north. This entry was posted in Virginia and tagged National Parks US, New, Smoky Mountains Blue Ridge Parkway, Travel, USA, Virginia, Waterfalls, WP Travel by Roads Less Traveled. Bookmark the permalink. very nice – brings back memories of my childhood when my dad would take us camping in the Shenandoah NP. 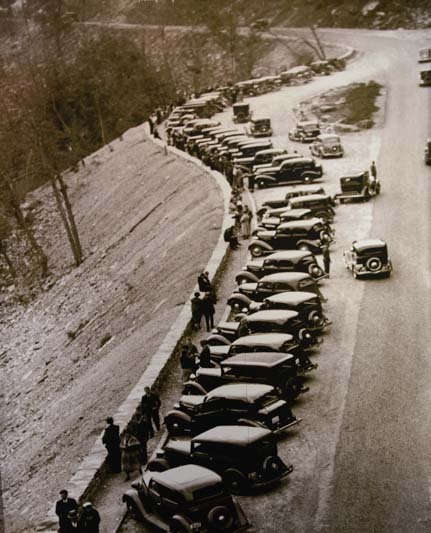 Many rides along Skyline Drive back in the day…. Safe Travels! What a great area for family camping. Must have been wonderful!! While in Canada, are you coming west thru Ontario. If so, what part. We live in London, Ontario and would certainly love to meet you if you are coming this way. Thank you so much for the invite, Bill. At the moment, we have no idea what we are doing after we leave Nova Scotia — so many great choices! If we come through western Ontario we’ll let you know. Your photos are stunning, not only in content but quality. What camera/lens do you use? We hit to road in 15 months……….cannot wait to live a similar life as you. We now use Nikon D610 cameras with a variety of lenses. For the first five years we used Nikon D40 cameras and for the next 2 we used Nikon D5100 cameras… I have a post planned detailing all the peripheral gear and resources we used for learning photography during our travels. Stay tuned! Your superb photos really capture the beauty of that area. We lived in Richmond for a short time when our boys were 12 and 15. One weekend, we took them on Skyline Drive to Dark Hollow Falls, Luray Caverns, and the Shenandoah Valley when the leaves were changing. It was some of the most gorgeous scenery and views we had ever seen . . . and we’re from Colorado. Thanks for the fond memories! What a fabulous weekend for you and your boys. Great area!! We are just getting into rving and have been many times to the Shennandoah but never in our RV. 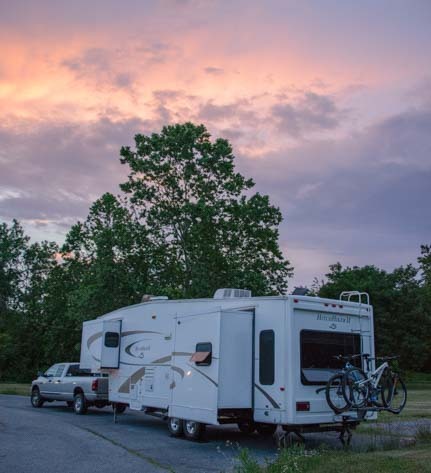 What campgrounds did you stay in their as well as on the Blue Ridge Parkway? We have a 25 foot travel trailer with one slide and can dry camp if necessary but would much rather have at least water and electricity. We didn’t camp in Shenandoah or on the Blue Ridge Parkway. We stayed 10-20 miles away in various places as we went north. 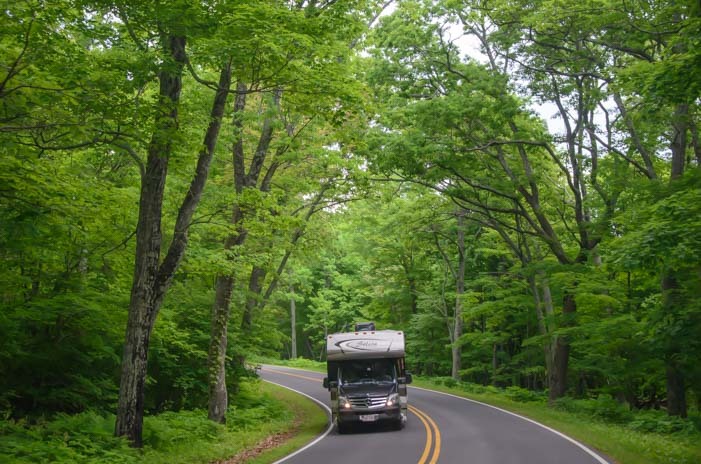 There are lots of camping options on the Blue Ridge Parkway and at Shenandoah, and there are lots of RV parks of all different types and styles in the nearby towns as well. 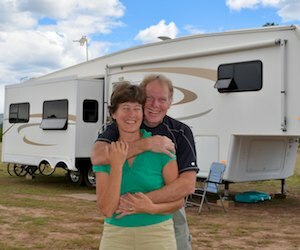 The campgrounds inside the Park and on the Parkway don’t have hookups but RV parks in the area do. We also did Dark Hollow Falls when we were in Shenandoah, but it was November so there was a lot less green around. Wish we would have got to drive the Blue Ridge Parkway like you but ours was only a weekend trip and there just wasn’t enough time. Thanks for sharing your trip! You are welcome, Rob. 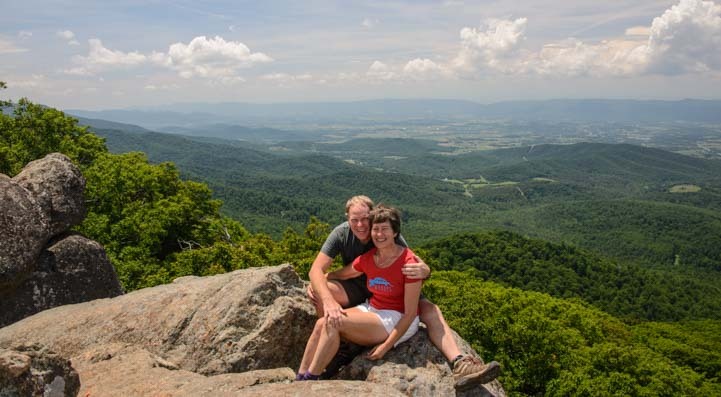 The Blue Ridge Parkway is very cool, and we loved the fact it’s tucked between two National Parks — the Smokies and Shenandoah! Enjoy your travels.